Choosing the right finishes can set the tone and enhance the overall design of your home's interior. 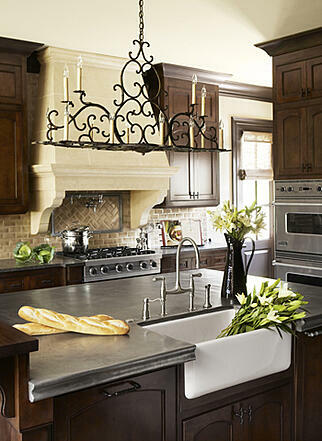 There are a variety of finishes to choose from when it comes to cabinetry/door hardware, plumbing, and the like, including nickel, brass and oil-rubbed bronze. When done appropriately, mixing finishes keeps your eye moving and creates more interest in your home, much like using multiple colors in a painting. There's a balance with how to mix finishes effectively though. Use too few and your audience is bored. Use too many and no one knows where the focal points are and your home will begin to feel disjointed. Here are a few pieces of advice if you are looking to mix finishes in your home. Choose finishes and mix them in a way that feels as though it was intentional. 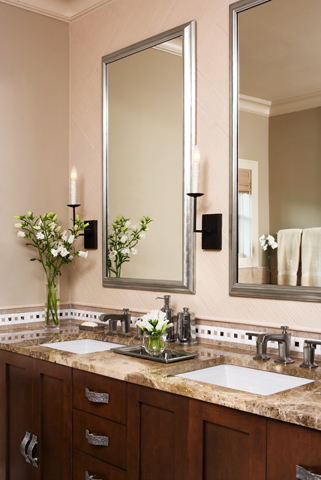 Having an entire bathroom with polished nickel fixtures and mixing in one antique brass element will feel like an accident or a mistake. If you are looking to mix, make sure you mix enough of each finish that makes it feel cohesive and purposely done. It's important to use the appropriate number of finishes in a space to avoid a disjointed and overwhelming feel. We recommend using no more than two finishes in a room; three can be acceptable in special circumstances. For example, in your kitchen, your faucets and island drawer pulls might be nickel and your lights and perimeter cabinetry pulls could be bronze. The variety and mix creates beautiful interest. 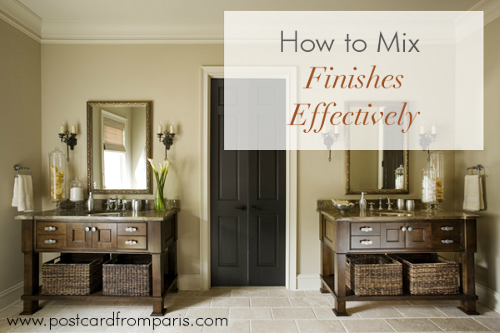 If your intent is to mix finishes, then make sure the different finishes are sufficiently different from each other. For example, if you are using polished nickel in a space, don't mix in brushed nickel. The two are too similar and it will look as if you tried to match and missed. 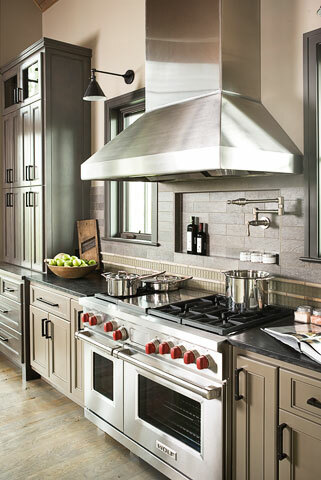 Our advice is to mix one cool metal or color with one warm metal or color. This contrast creates stylish tension between the two without clashing. When choosing to mix finishes, certain finishes will stand out more than others. Make sure the contrasting finish is used for a fixture that you wish to draw attention to. For example, if you have chosen a unique faucet, showerhead or chandelier, choosing a different finish for these fixtures is an effective way to call attention and draw someone's eye to some of the unique design elements you've chosen for a space. If you are unsure about what metal finish to choose for a particular space, let your color palette dictate the type of finishes that would complement and work well in the space. For example, if you have a very neutral or all white color scheme, polished chrome or nickel finishes will blend beautifully. Combining one of those with a bronze or copper finish will add warmth and color the space might need. If you are in the process of selecting plumbing fixtures and trying to decide on a finish, download these tips from our design team to help make the right selections.